NOTE: On this Andorra ride, quite a lot of lunches and dinners at local restaurants, hostels, hotels are not included. They are paid locally and covered directly, the cost is 200Euros which needs to be paid at the beginning of the ride. Excluded – Flights, transfers, soft drinks & alcohol, coffee at dinner & tips. NOTE There may be some meals that are not included, which we will specify at time of booking. Transfer costs range from €30 – €45 each way per person from Girona airport and €45 – €60 each way per person from Barcelona airport. Exact cost depends on chosen trail. 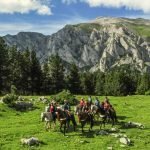 This is an amazing collection of 3 different trail rides in the North of Spain for the adventurous rider, centering the high mountain ranges of the Pyrenees. 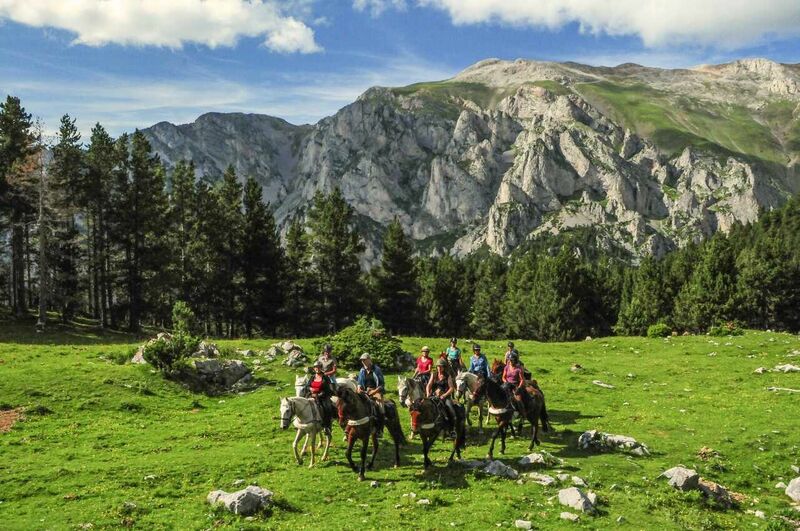 The Herdsman is an exciting ride from the Costa Brava to the alpine peaks of the Pyrenees, which follows the Herdsmen’s trails called the “Camino Real” through the Eastern part of Catalonia. 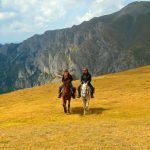 The Bandit trail, the story of the “bandolero” Joan Sala Serallongo, is explored by riding through the vast area of mountains, canyons and volcanoes where the gangs of outlaws hid from the King of Spain – he is likened to our own Robin Hood of Sherwood Forest. 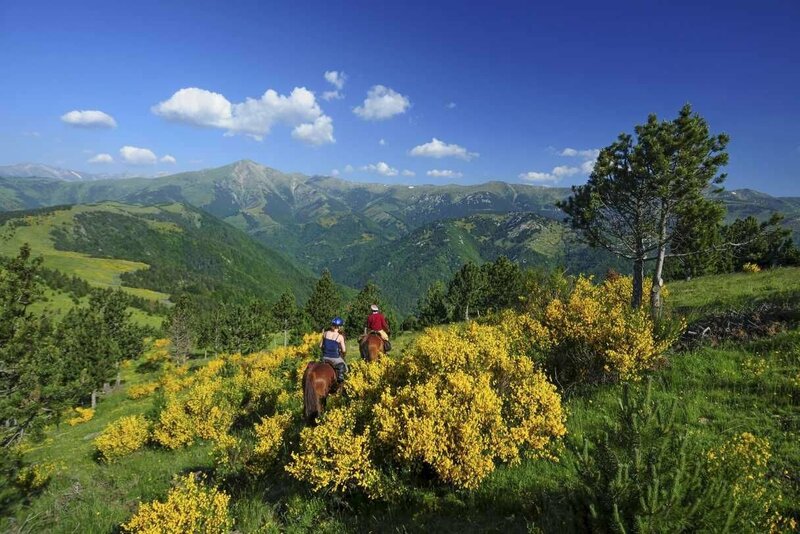 The Andorra trail, which is some 350kms long and possibly one of the most challenging European rides in our collection, takes you through 3 countries, from the Mediterranean coast to the Pyrenees. This is truly an adventure of a lifetime, with some nights spent camping under the stars. You will be riding, fit, Andalucian type horses, which have been selected carefully and well handled by owner Rude Sotlz. Along the way, you can expect to stay in guesthouses, hotels, and farmhouses, all chosen for their warm welcome and charm. NOTE: On the Andorra Trail there is a maximum weight limit of 85kgs. All the accommodation is carefully selected, they are charming, clean, comfortable and well run. 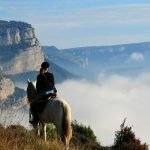 Please read all the individual itineraries below for each ride to get an idea of the type of overnight stays on the different trails. There is camping on the Andorra Trail. Nowadays herdsmen still pass along the so called “Camino Real” through the north-eastern part of Catalonia. In winter, the herds stay in the mild coastal areas and in summer they make their way up towards the Pyrenees. Round polished, soft, high mountain hills build a contrast to the wild and bizarre rock formations of the Garrotxa mountains. The Mediterranean Costa Brava, deep forests and meadows of the alpine mountains determine the landscape. 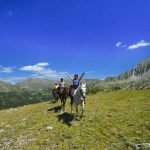 This diverse trail through quiet and remote herdsmen’s land is an extraordinary and unforgettable adventure for sporty and ambitious horse riders. Day 7: ¡Hasta la vista, amigos! 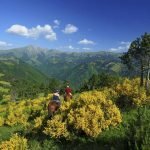 We pass through the hilly countryside of the pre-Pyrenees and follow the river Fluvia in the direction of the mountain, a route taken by old herdsmen like Juan the Shepherd. The pretty villages of the Alt Empordà are impressive witnesses of an amazing past. In a glade near the river, our friendly “Catalan Buffalo” meets us with a glass of Cava and a beautifully set table. After our siesta we ride quickly to the medieval town Besalú. Our accommodation for tonight is a hotel right next to the beautiful romantic bridge with a view over the river Fluvià and the town. Before having dinner in the enchanting garden of the restaurant, we can stroll through the alleys of Besalú. 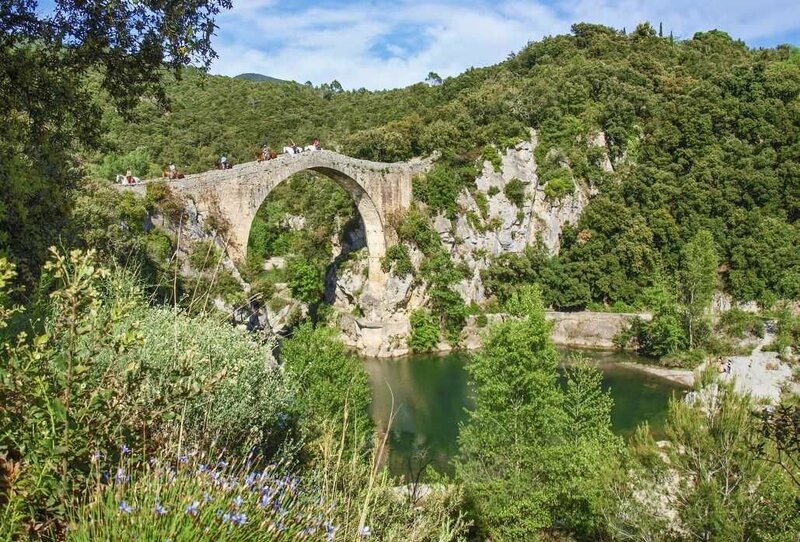 We ride to the wild hilly countryside of Garrotxa, passing through the medieval town of Besalu and crossing the Romanic bridge of Llierca. We find sparkling turquoise rock pools where we can go for a refreshing swim. Our agile Andalusian horses carry us safely over the pass of Santa Barbara. From the top we enjoy the fantastic view of the bizarre rock formations. Our destination is a small mountain village where we stay overnight. The valley of the Llierca lies in front of us with its strong lime rocks. Only the sound of hooves, the splashing of a stream and the calm sounds of the cow bells interrupts the silence of this secluded area. Birds of prey, reptiles and butterflies accompany us on our way and with a bit of luck we will even see wild pigs or a badger. 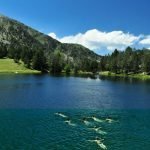 We will stop for our picnic under two-thousand-year-old oak trees where the turquoise water of the streams invites us for a refreshing dip. In the afternoon we reach the picturesque mountain village of Beget, where we stay for the night. Our four-legged friends get to fill their belly’s in the green mountain meadows. 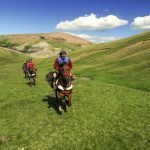 Our horses carry us deeper into the Pyrenees and an ancient medieval merchant’s path takes us over the border into France. We leave the pre-Pyrenees and ride through beech, oak and chestnut forests that cover the hills. The view of the surrounding 9000 feet high mountains is tremendous. We have an early start to ascend to the high regions of the Pyrenees. 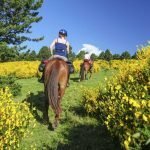 Our horses carry us over the immense cattle fields where we meet cows, sheep, goats and the occasional wild Pyrenean horse. We arrive at the high regions which have alpine character, with Narcissi, iris, gentian and alpine roses that transform the hilly meadows into carpets of flowers. We reach a mountain pass, an infinite steppe of grass and stone, at 6000 feet. The view is magnificent. To the west we see the highest peak of Catalonia and in the east the Mediterranean glistens in a deep blue. 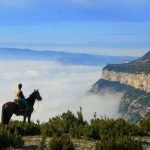 We take a siesta and observe a vulture family rising into the sky, then ride on secluded paths through this wonderful mountain paradise on our way down to the town of St. Joan de les Abadesses. We spend the night in a small authentic mountain hotel where we let our unforgettable trip end with a dinner together. Day 7: Hasta la vista, amigos! After breakfast we say farewell and transfer to Girona or Barcelona or continue with a trail to the sea. The Path of Herdsmen Trail is something for real mountain lovers who don’t want to miss out on tasteful accommodation. 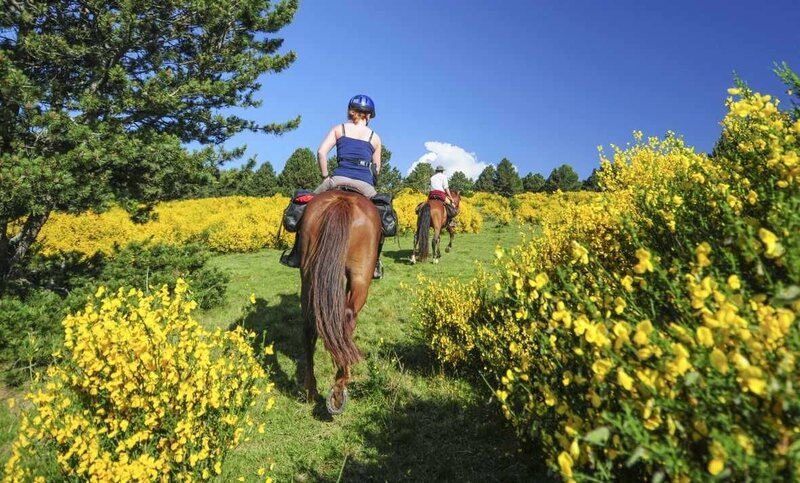 You will enjoy a dynamic ride from the Mediterranean lowlands to the alpine mountains of the Pyrenees. Lively canters lead into extraordinary climbing passages. Magnificent views will be your reward for the occasional steep climb. In order to cope with the daily descents easily and safely, we recommend comfortable walking shoes with a grip tread. Most days you spend 5-7 hours in the saddle and on the swimming day it is 3 hours. The mountain trail requires some stamina and your desire to be guided in a magnificent mountain world. We ride through alpine terrain, so good weatherproof clothing and suitable sun protection are needed. You do not need to have a head for heights for this trail. The Herdsmen Trail connects seamlessly with Bandit Trail below, therefore you could make this into a 15 day round trip trail. The Bandit Trail is based on the biography of the famous “bandolero” Joan Sala Serrallonga, the Catalonian Robin Hood. In north-east Spain, the bandit Serrallonga wandered around the mountains of Guilleries and Garrotxa during the 17th century. The vast pathless area of woodland offered good hiding places to outlaws. Canyons, table mountains and volcanoes rise up in this wild landscape. Rivers, lakes, and waterfalls provide pleasant swimming opportunities. In the picturesque villages, there are still stories told about the gangs of thieves and the Catalan rebels. Today we find an incredible riding paradise where outlaws once hid. 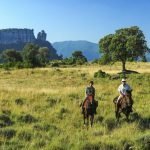 The trail of bandits is an extremely diversified horse riding trek through massive canyons, table mountains and volcanoes. The transfer brings us into the mountains. Deep in the Spanish Pyrenees, at the foot of the mountain range of Cavallera, there is the small mountain village of St. Joan de Abadesses. This is the starting point of our trail of bandits. During our first meal, together we get to know our guide and chat about the upcoming horse riding trek. The horses are saddled and we mount up. The trail weaves through a marvelous mountain landscape which appears rugged or soft depending on the season. The air is pleasantly aromatic and there is peacefulness with only the sounds of nature. High above on a mountain range a small roman church enjoys an incomparably beautiful position where we stop for a picnic. In a little mountain village, we stay overnight in a cozy guesthouse, where Joan serves us the ‘best’ Paella. We are riding to the high plateau of Collsacabra, where we can see the merging of the north and south, Mediterranean Sea and high mountains. Lush meadows and dense beech forests cover the land. Ferns spread over, the jungle sprawls and seems to be impermeable. The temperatures are pleasantly cool, with springs and calm brooks refreshing us on the way. 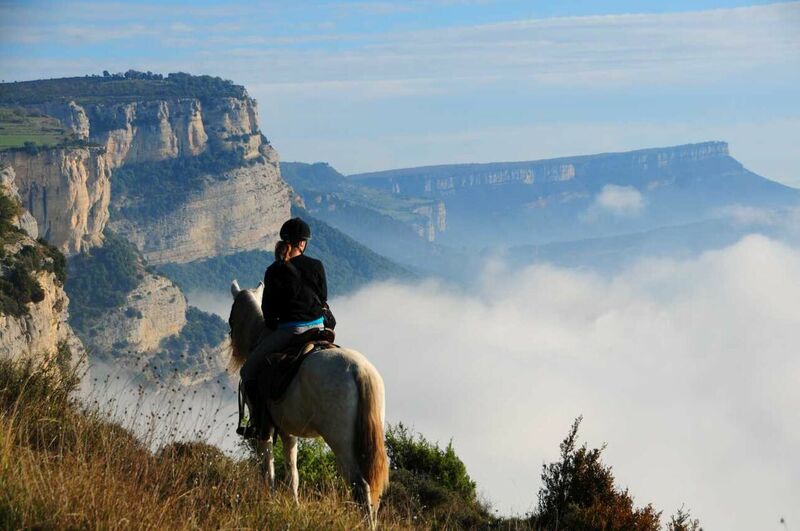 In the heart of the high plateau there is the remote but very cozy riding farm of Jordi. Here we can only hear the wind in the trees, the singing of the cicadas and the splashing of the brook. In the evening, we enjoy a bandit’s menu and a glass of wine at an old wooden table, while Joan tells Catalonian stories of the desperados. 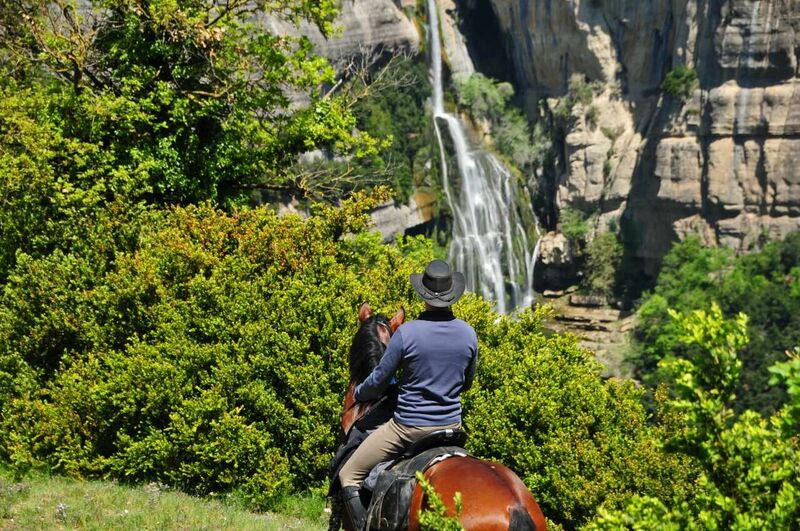 Brilliantly our agile “Andalusians” climb over difficult terrain. In spring and summer, the deep green beech forests blink through grey rock mountains, and on the ‘Indian Summer’ days of autumn the forests shimmer like gold – the ambience reminds us of Canada. 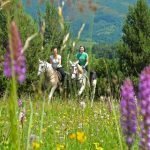 Vast cattle meadows give us amazing views over valleys and mountains and we stop for a picnic in the ‘open air restaurant Panorama-Trails’. Speedily in trot and canter we approach the abundant table mountains. Here we see canyons and waterfalls and hear the calling of birds of prey that sail above. Like an eagle’s nest the small village of Tavertet is located majestically on the edge of a Table Mountain, where we have a beautiful view looking down at a canyon lake that shines deep green below us. High on top of the edge of the table mountains we ride to the mountains of Guilleries, home of the bandit Serrallonga, the Catalonian Robin Hood. The view from the ‘roof top of Catalonia’ over the green mountains is unique. The evergreen and moist landscape is in contrast to the red, brown and silver-grey rocks of the table mountains. In the middle of this fascinating mountain landscape we discover lonely chapels and twisty natural stone villages dating back to Serrallongas’ times. At a clearing, we rest and feel like ‘Outlaws’ from long ago, then we continue our trek through a mystical jungle like area with ferns that cover the path. At the highest point of the Table Mountain the monastery ‘El Far’ rises up majestically. 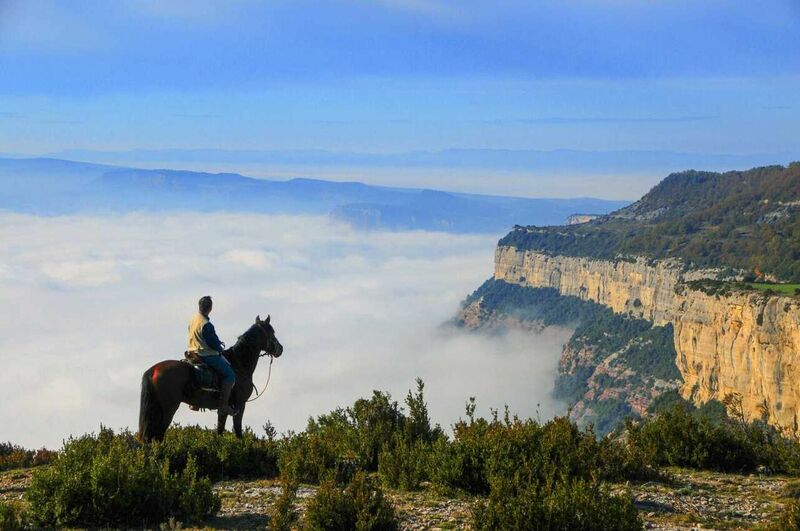 It is one of the most beautiful viewpoints of Catalonia. We stay here overnight and wake the next morning to the sun rising up over the sea. We leave the Guilleries and emerge into the land of volcanoes. The landscape is well cultivated but also has a wilderness about it. The extinct volcanoes lie there resting until the end of time. The last eruption was some thousand years ago and only the black lava and some craters remind us of the explosions. In the mediaeval village Santa Pau we find cozy accommodation. 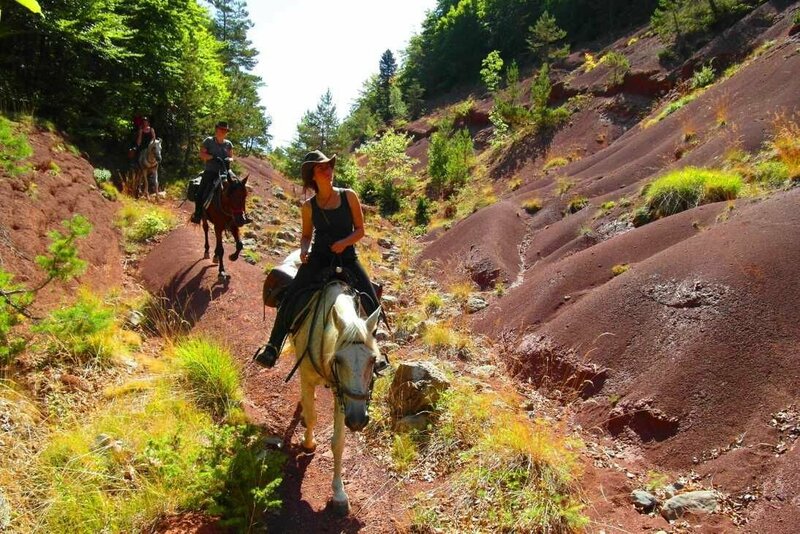 We trot and canter along the brook “Ser” and leave the area of Garrotxa. The brook leads into the river “Fluvia” which points us towards the Costa Brava. Stone oaks and pines are the dominant trees here and under their pleasant shade we enjoy our bandit’s picnic. After a siesta, we ride at good speed towards the medieval town Besalú. Our accommodation for the last night is a hotel right next to the beautiful romantic bridge with a view over the river Fluvià and the town. Before having dinner in the enchanting garden of the restaurant, we can stroll through the alleys of Besalú. During our farewell dinner, we discuss the adventures of our horse riding trek. After breakfast, we say goodbye. Transfer to Girona or Barcelona, or continue to a coast trail. 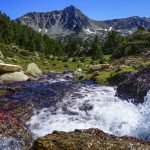 Andorra, France & Spain Trail – 3 countries in 13 days adventure! 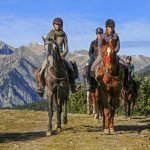 Andorra, France, Spain – 3 countries in 13 days – along a 350km trail the Andorra Trail offers probably the most challenging horse-riding adventure in Europe. 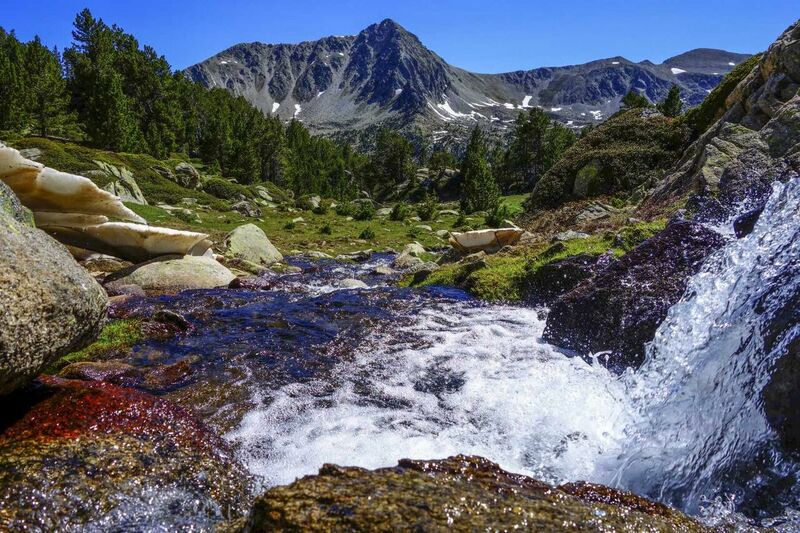 This outdoor packed trip goes from the Mediterranean coast to the central Pyrenees. It is an impressive trip for adventurous nature enthusiasts. You will sleep out in the wild for 4 out of 12 nights. 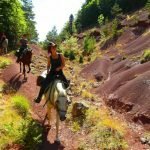 It is not only one of the longest European trails we offer, but at the same time one of the toughest trail rides worldwide. 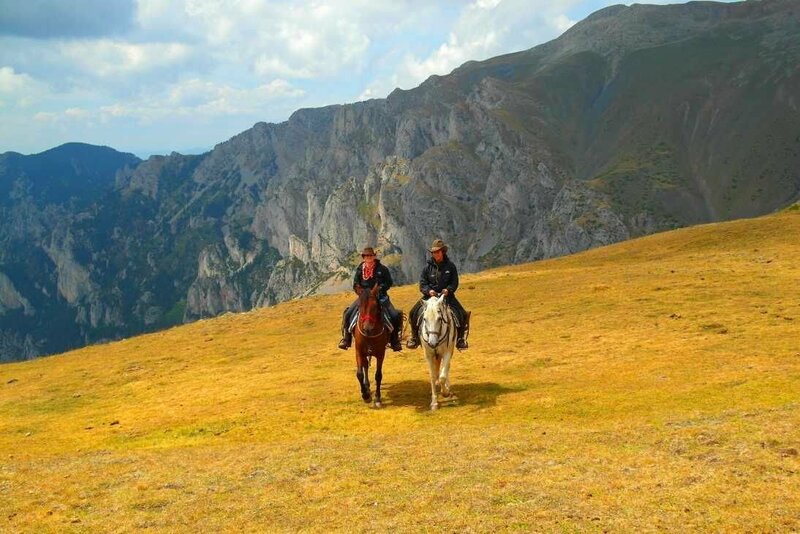 An altitude difference of 11,000 metres is covered during the trip – a number that is hard to beat on horseback! Day 13: Hasta la vista, Pyrenees! Transfer from the airport and spend the first night in a hotel on the Mediterranean coast. The salty smell of the Mediterranean Sea gives you a first impression of the days to come. If you like you can have a swim in the refreshing water. Enjoy your dinner with a sea view and get to know your fellow adventurers. After a hearty breakfast, we get to know our horses and get ready to start our adventure! Leaving from the coast, we ride towards the Albera Mountains enjoying fantastic views over the rugged coastline of the Costa Brava. Underneath shady trees our first picnic is waiting for us. The afternoon brings breath-taking views of the French and Catalan coasts. Like an amphitheatre, a bizarre mountain backdrop surrounds the plain lying ahead of us. Pine forests, vineyards and olive groves characterise the Mediterranean landscape. After some gallops we reach a small mountain village. Here, we spend the night in an old castle. For dinner, we visit a local bar with delicious Catalan cuisine and “vino tinto” from a Bodega nearby. We begin our day with a hearty breakfast before taking time to enjoy a relaxing swim in the beautiful natural silver pool in one of the river gorges. Refreshed, we get ready for our journey inland with the horses and pass through the beautiful landscape of Alt Emporda with an atmosphere that reminds us of Africa. Cork oak forests and vineyards accompany us on our way until we eventually discover a gorgeous lake. Before we have lunch, we enjoy a bath in the bright green water of the lake. Our afternoon ride takes us along the lake, through the forested hilly landscape of the lower Pyrenees. In the evening, we arrive at the ‘Hostal del Aigua’ where a hot shower and a delicious dinner prepared by our chef de cuisine David is waiting for us. In the morning, we follow the river upstream and then head along the mountain tracks at a fast pace with some long-relaxed gallops. 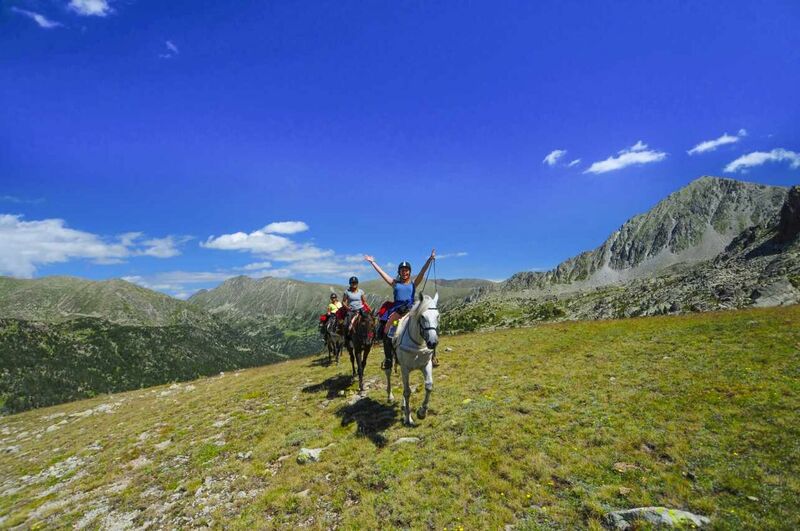 We stop in a wonderful river valley for a ‘cowboy picnic’ – the horses enjoy the ‘picnic’ as well. And that is not all: The beautiful turquoise water pools of the mountain stream invite us to swim, jump and dive. The murmur of the stream relaxes us and we have a siesta. Now we are ready to climb uphill step by step! We cross a Roman bridge with our horses. 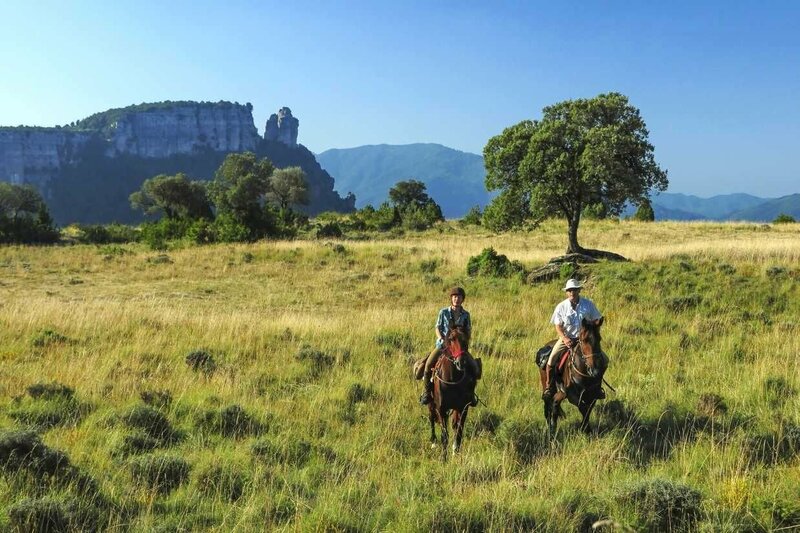 Via a ‘jungle trail’ we immerse ourselves in the loneliness of the Garrotxa Mountains. We make our camp for the night at a beautiful and atmospheric chapel. The acoustics, the solitude and the magnificent panorama provides a feeling of happiness. Before dinner we watch our horses in their meadow and look back on the high points of the day. 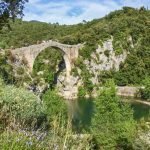 The mountain landscape now subtly changes as we travel into the area of Alt Garrotxa with its deep valleys, craggy rock faces and thick oak forests. As we cross a small high plateau we pass into France! The red volcanic earth (‘Terre rouge’) gives an amazing atmosphere to the landscape. After some fast gallops we arrive in a typical French Pyrenean village. Under a Roman bridge, we find two splendid water basins for our refreshment. The afternoon takes us further into France. We pass through beech groves and later follow a mountain track evolving from the trees. This track leads us to our accommodation for tonight. We admire the splendid view on the surrounding peaks of the Pyrenees and look forward to a warm shower. With a cosy dinner we let this day come to an end. Today we have some spectacular climbs up on endless mountain meadows! 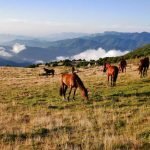 We see large herds of mountain horses as well as cattle, who watch us curiously as we listen to the sound of their bells. Above us, the vultures and eagles soar and they show us their incredible wingspan. We can enjoy some long and exciting gallops as we climb through the fields. For lunch, we make a little detour back to civilization and visit a restaurant in a little town. In the afternoon we pass fabulous forests; the moss covering the ground swallows the sound of our horses’ hooves so that we climb further in a peaceful quietness. In the evening we reach our campsite for the night. The shepherd’s refuge provides space to make a fire and cook a well-deserved barbecue. Setting off, we once again emerge from the forests into the open mountain meadows. If we are lucky we will see chamois silhouetted on the skyline, jumping from rock to rock at a breath-taking pace. Today we will have many opportunities to trot and canter uphill, culminating in a breath-taking sprint that takes us to the ridge. What a view we have from here! Tonight, we stay in a guest house for hikers. We can have a hot shower and go to bed in the dormitory, after having a hearty dinner prepared by our innkeepers. We leave the dormitory before sunrise and get prepared for the day. In the special spirit of the early morning, we climb through the pine forest into the stunning Parc Natural de Cadi Moixero. We get to a retreat where we stop off for a snack and a cold (or hot) drink. As we descend we catch a glimpse of the impressive Plains of Cerdanya before an exciting gallop takes us to our picnic site overlooking the plain. Tonight, we are accommodated ‘extravagantly’. We reach a village built of natural stone, where a farmhouse with cozy rooms and a hot shower is waiting for us. Dinner is being served in the garden of this wonderful place. 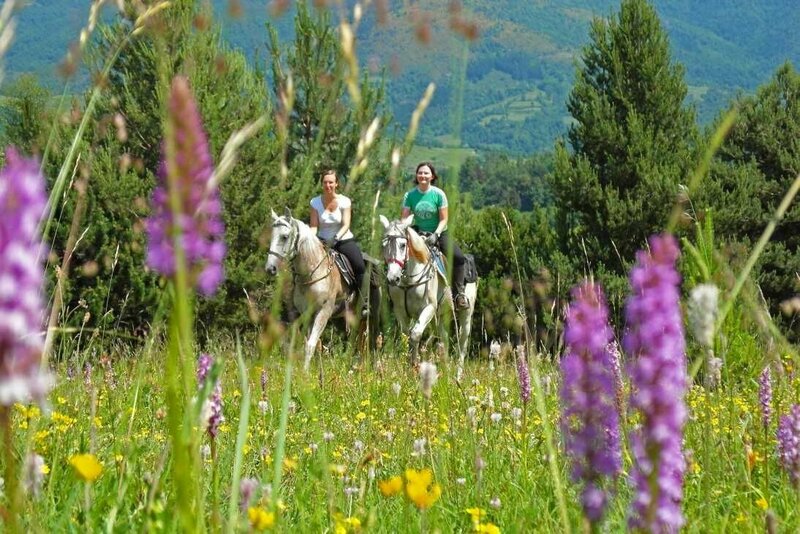 Quickly we cross the fertile plane of the Cerdanya. Lots of meadows and fields allow us to trot and canter. 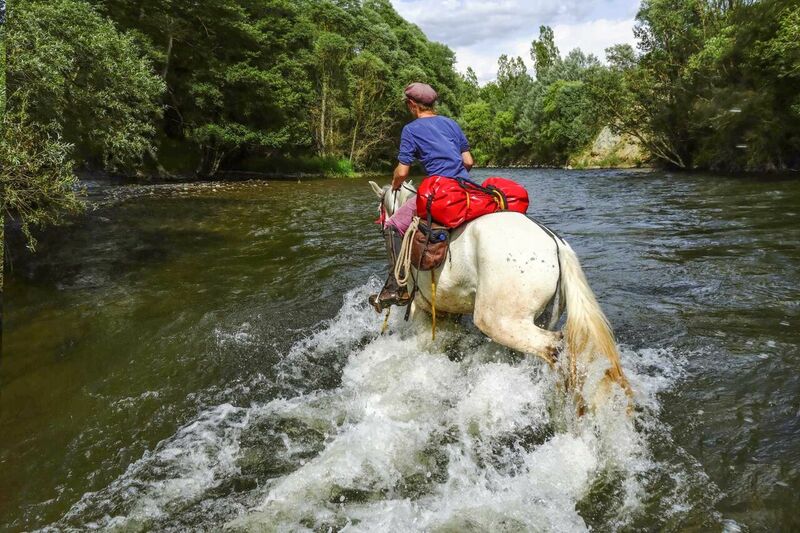 When passing the river Ter, our horses have to fight the water current. We enter the land of the Cathar. In a glamorous valley of the Pyrenees, we make our camp. The turquoise water basins of a wild river become our ‘bath tubs’ for tonight. Up high on a rock, the remains of a Cathar castle remind us of days gone by. 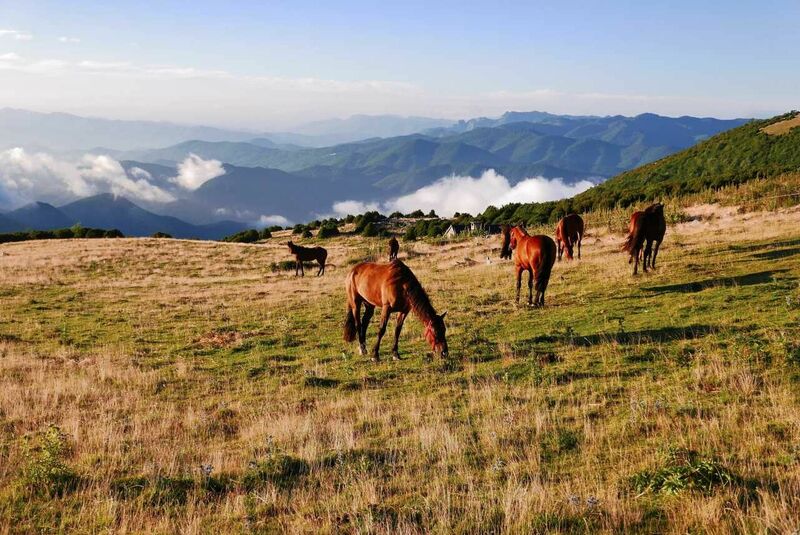 Our horses peacefully enjoy the nourishing, mellow green grass of the high mountains. In this ambience we get to rest and watch the starry sky before falling sleep. Today we set out for a short but challenging climb into Andorra. It is an exciting day, as we are carrying with us all that we will need for the next two days! We are rewarded with the sight of a stunning lake that could be something from the Caribbean – but at 2,500m! 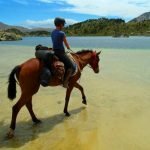 Here we are – beach to beach and three countries in just 10 days on horseback! 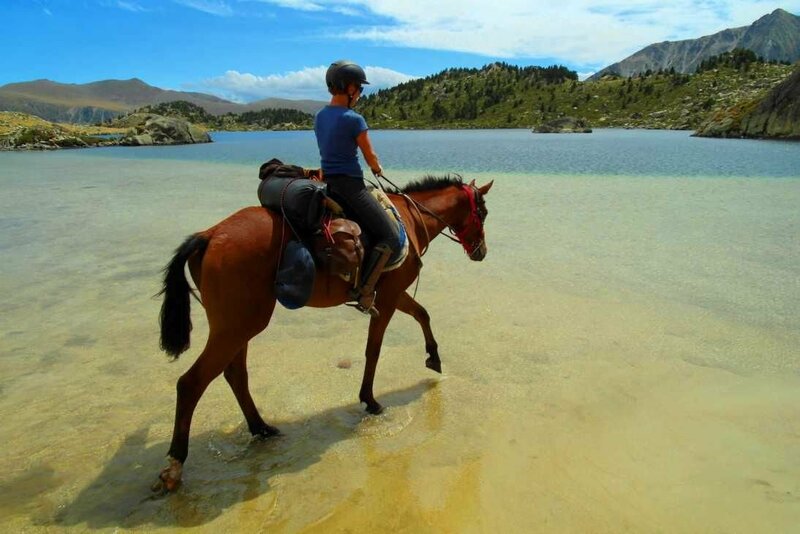 The horses have a beautiful field overlooking the lake while we enjoy our picnic at the lake and relax on the beach. Of course, we also enjoy a swim and take a siesta! 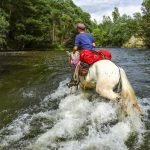 Refreshed and relaxed, we get back on our horses after the siesta and rejoice at the sight of the many streams along our way. Right in the middle of the High Pyrenees, we arrive at a wonderful place in the evening where we make our camp for the night. There is a river close by where we can bath and refresh. 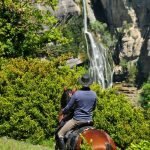 From our saddle bags, we conjure up a rich meal and get to rest with full bellies, while the air around us is filled with the calming sound of the cattle bells. We keep a look out for marmots as we pass through beautiful mountain meadows and river valleys. After some challenging climbs, we reach our picnic spot at a hidden mountain lake. 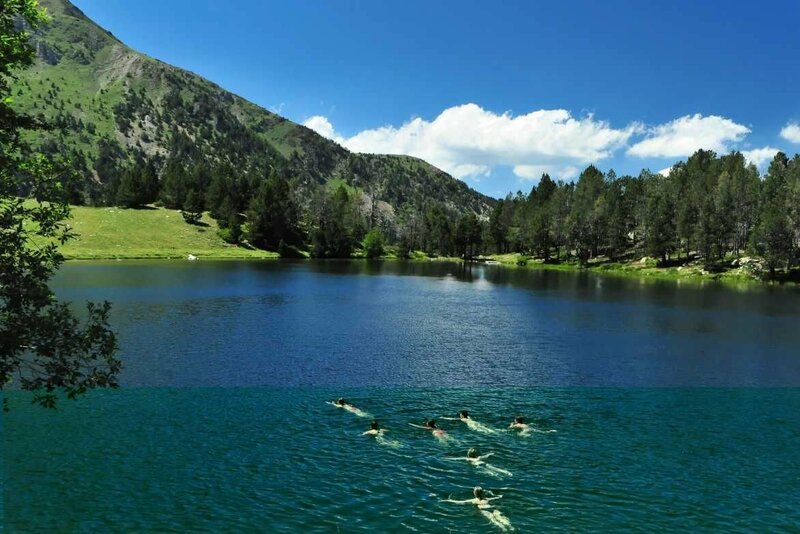 Here we can swim and relax before the afternoon takes us to the highest point of the route at 2600 m.
From here we enjoy the spectacular views of the Serra de Cadi and the Aneto, the highest mountain of the Pyrenees. Carefully, we make our way down through this magical landscape until we get to a shining mountain lake. We have reached our destination! We are back in Catalonia. In a guest house nearby, we enjoy a well-deserved hot shower and our farewell dinner, where we review our adventure. What a wonderful time we had! After breakfast we say farewell and transfer to Barcelona. This route is an incredible and unforgettable experience. 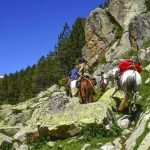 However, to get the most from this unique adventure trail ride, you must be aware of a number of factors and come prepared and able to adapt to the conditions. 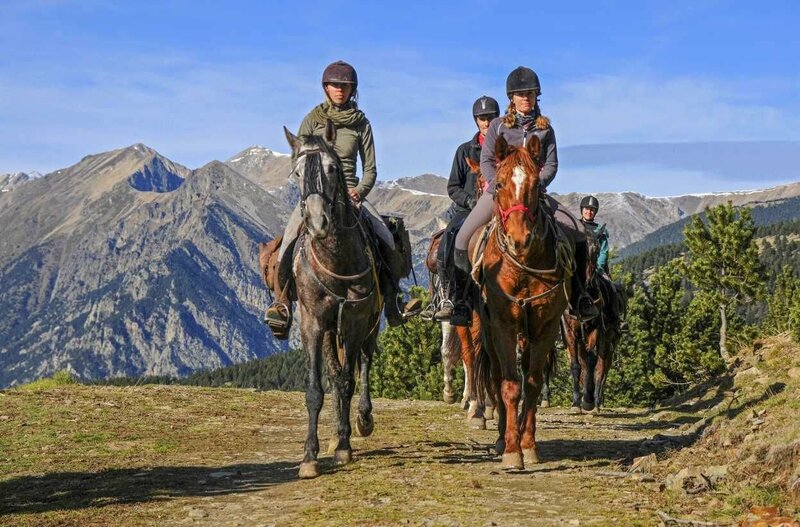 The riding is through challenging terrain and the days are long – often with up to 8 hours in the saddle, covering up to 50 kilometers in one day. 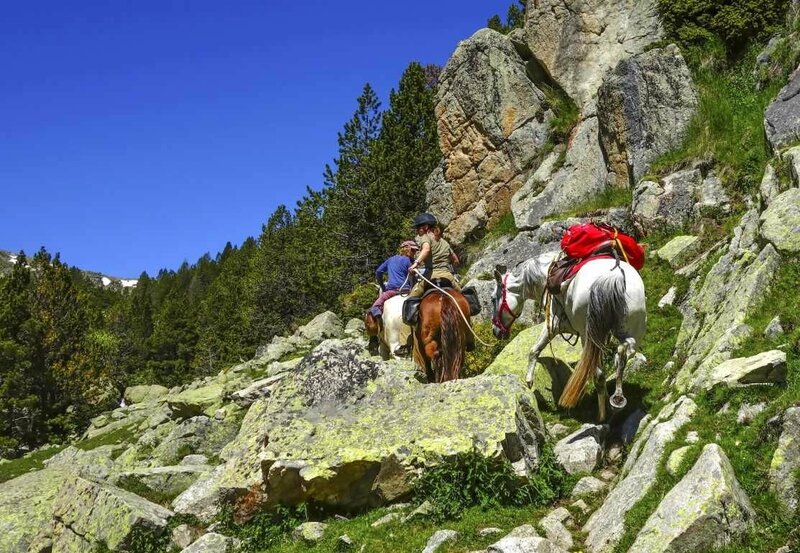 The Andorra packing trip is known as the most challenging trail ride in Europe! Only experienced riders will be able to enjoy this route and you must be comfortable and safe at all paces. Furthermore, you should be able to mount and dismount on both sides of your horse without assistance in difficult terrain. 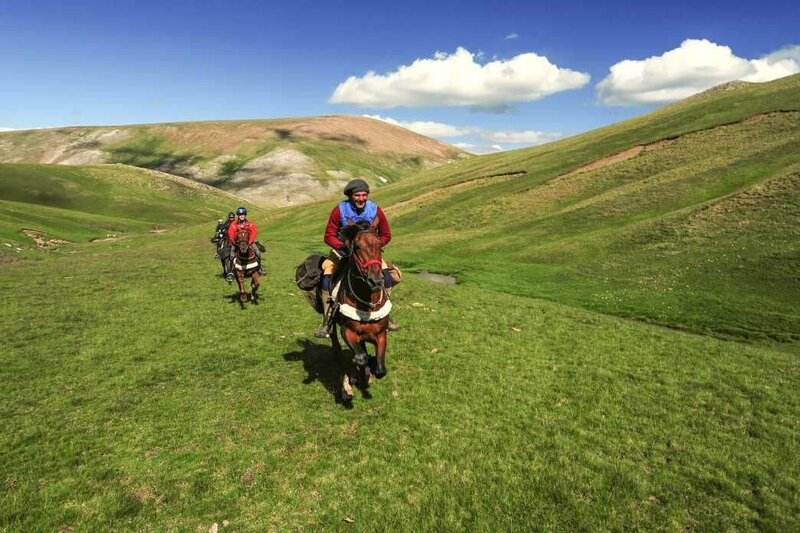 Where the route is particularly challenging, we have to dismount and lead the horses. You should therefore be fit and able to hike both up and downhill in mountainous terrain. In addition, you should not attempt this route if you are afraid of heights. Being in the mountains means that conditions can change quickly and unexpectedly. You should therefore come willing to be patient, flexible and understanding when plans change due to unforeseen circumstances. Sleeping outside in the mountains allows you to really experience the freedom and nature of this beautiful area. However, you must understand that most nights are spent at campsites without facilities such as toilets and hot showers. Instead you should be prepared to pitch your own tent, help with the food and live in more basic conditions. You will be rewarded hugely, with peace and tranquility below a starry sky. This route has a maximum rider weight limit of 85kg.